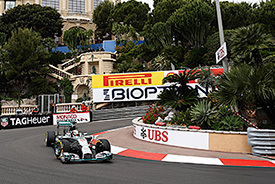 07:26 Good morning and welcome to AUTOSPORT Live's coverage of the 2014 Monaco Grand Prix weekend. We're just over half an hour away from practice and, even by Monte Carlo standards, today is going to be a step into the unknown for the Formula 1 field. 07:35 Many drivers have already declared that this will be a much-harder Monaco weekend than the last few years have been, thanks to the very-different characteristics of this year's cars. "We drive with the car a lot more sideways [in 2014]. "The torque we have from the engine is maybe double what we had last year, and the grip from the tyre is not very high, so Monaco will be a very easy race to crash. "I think it will be the toughest race of the season." 07:42 There has already been single-seater track action in Monaco this morning. Formula Renault 3.5 is making its annual appearance on the F1 support bill, and Norman Nato led his Red Bull protege DAMS team-mate Carlos Sainz Jr in a very early-morning practice session. 07:51 This time a year ago, Nico Rosberg was quickest for Mercedes - his benchmark time a 1m16.195s. Everyone pretty much avoiding the barriers on Thursday morning in 2013, although Romain Grosjean had a minor prang that set the scene for a weekend of rather bigger ones. But that proved a turning point for the Lotus man, who has shed his crash-happy reputation almost entirely in the 12 months since. 07:53 BEN ANDERSON: "Drivers changing helmet designs as often as they change underpants is usually quite annoying, but at Monaco they get extra leeway on account of nods to history. 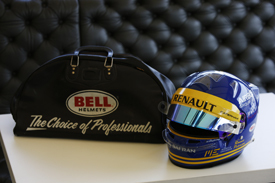 "F1 rookie Marcus Ericsson can take a bow this year; he'll be running a Ronnie Peterson livery on his lid, which he's apparently carrying around in Peterson's original helmet bag, thanks to supplier Bell." 07:55 And here is that helmet and bag from Ericsson. An extremely cool gesture. "So today we'll be more about running than set-up changes and aero tests. Need to see that track evolve first." 08:00 The light turns to green and Monaco 2014 has begun. 08:02 Perhaps unsurprisingly, there's a clutch of rookies among those straight out on track. Kevin Magnussen, Esteban Gutierrez, Jean-Eric Vergne, Pastor Maldonado, Fernando Alonso, Marcus Ericsson, Adrian Sutil and Valtteri Bottas are first out for their installation laps. 08:03 EDD STRAW reports that Marussia is running new brake drums on Max Chilton's car this morning. If all goes well, both cars will have them for Saturday. 08:03 All teams have an extra set of soft tyres they can use in the first half hour of the session, so that's the rubber they are most likely to be using from the start. 08:05 Even on the out-lap, reports EDD STRAW from trackside, Kamui Kobayashi kicked the back out at the chicane. Big oversteer moment to correct. 08:06 A busy pitlane now as cars come in and out between installation runs. The only cars we're yet to see are the two Mercedes, Sebastian Vettel's Red Bull and Romain Grosjean's Lotus. 08:07 Vettel is now on track - and has it to himself. 08:10 EDD STRAW: Very preliminary observations based on a few gentle early laps, but we're seeing way more cars out of shape and battling wheelspin at the chicane than in previous years. That will get easier as the track gains grip, but there was certainly plenty of wheelspin for Vettel on his out-lap. 08:10 Ferrari reports the track temperature is a lowly 23 degrees Celsius. Still overcast and around a 20 per cent chance of rain. 08:11 Rosberg comes out and does the first flying lap of the day, a 1m24.681s. 08:12 Rosberg brings it down to a 1m22.534s next time around. 08:14 EDD STRAW: Just as in the last two years, Rosberg is very confident on the brakes into the chicane. There's still loads more to come, though. 08:14 As Rosberg improves to a 1m21.070s, Ericsson puts in a rather more cautious 1m35.105s. 08:15 Kobayashi outbrakes himself into the chicane in front of EDD STRAW and takes the safe option of cutting the corner. 08:16 EDD also spots a big rear-end slide from Maldonado on the way in, but it's well corrected. 08:16 Up front, Rosberg improves to a 1m20.461s. Bottas and and Gutierrez have also now put in slow, tentative times. 08:17 EDD STRAW: A big moment for Gutierrez, who struggled to get the Sauber stopped. He manages to haul it into the chicane and catch the slide. 08:17 Rosberg does a 1m20.094s as he continues to improve on his seventh lap. 08:17 EDD STRAW: The mass chicane cutting has begun, Perez and Grosjean's turn now. Perez was nowhere near stopping. 08:18 We've now had times from 14 cars, but to underline how little most drivers are pushing yet, Rosberg is fastest by 3.241 seconds at the moment. 08:19 EDD STRAW: A bit of a moment between Hamilton and a Toro Rosso. The Mercedes locked up into the chicane while trying to get past, and had to do it on the way to Tabac instead. 08:19 Ricciardo is the latest to entertain EDD STRAW at the chicane by cutting the corner. It's a tricky downhill braking area with a few bumps, so it's easy to misjudge. 08:20 Hamilton closes in on Rosberg in second place, but he's still 1.081s down. 08:21 Ricciardo's onboard camera shows how busy drivers are thanks to the combination of new cars/new track surface. It looks very tricky out there. 08:22 Now it's getting closer at the top, as Hamilton closes the gap to Rosberg to 0.228s. The Mercedes are 2.3s clear of the rest. 08:22 'The rest' are led by Ricciardo's Red Bull, Button's McLaren, and Force Indias of Perez and Hulkenberg. 08:24 That big gap doesn't last - Ricciardo closes to within a second of the Mercs, then on the next lap takes first place with a 1m19.912s. 08:25 Mercedes is sporting a new, much bigger monkey seat than usual in the rear wing. 08:25 That lap from Ricciardo puts him 0.182s ahead of Rosberg. 08:26 Ferrari has also modified its monkey seat for this race, but the Mercedes one looks significantly bigger. 08:26 EDD STRAW: Both the Mercedes drivers look superb in different ways. Rosberg is smoother, keeping everything under control, carrying good speed and controlling the wheelspin. Hamilton is more aggressive, really leaning on the car on the brakes and carrying speed on the turn-in. He then catches the rear beautifully as it steps out on the direction change. 08:26 Fernando Alonso gets Ferrari up to third, splitting Rosberg and Hamilton. 08:27 Force India remains well-placed: Perez is fifth and Hulkenberg seventh, split by Button's McLaren. 08:27 Yellow flags on track as Chilton spins at Mirabeau. 08:28 EDD STRAW: Success rate of Saubers at making the chicane without a massive panic is poor. The car looks like a real handful. 08:29 The yellow flags are now gone, but Chilton seems to have failed to get his Marussia going again. 08:31 Marussia confirms that's it for Chilton in first practice. "Problem for Max, whose car is now stranded on track. That's his session over rather too prematurely." 08:34 Rosberg might take top spot back from Ricciardo with this lap. 08:35 No, Rosberg won't, after a strong start, he backed right off in the final sector and stays second. 08:35 Only the two Mercedes out on track at the moment. 08:36 Now Rosberg does take first place back with a 1m18.970s, 0.942s faster than Ricciardo. 08:38 EDD STRAW has relocated to the inside of Tabac. The inside wall has been removed here so it's now possible to watch from ground level. You can stand near the apex and really see the cars sliding mid-corner. There's no margin for error. 08:38 Hamilton improves and is in second again, just 0.003s behind Rosberg. 08:39 Rosberg moves the goalposts with a 1m18.477s, nearly half a second clear of Hamilton. 08:40 EDD STRAW: Rosberg was mega through Tabac on that lap. He's carrying lots of speed and sliding the car beautifully. 08:42 Now Hamilton beats Rosberg for the first time this morning with a 1m18.271s. That gives him first by 0.206s. 08:43 EDD STRAW: Hamilton is mighty through the Swimming Pool as usual. He seems to have the car slightly more settled on entry than his team-mate. 08:44 Maldonado pops up with his first fast lap of the morning, a 1m20.682s puts his Lotus into sixth. 08:44 The gap from Hamilton's Mercedes in first to Ricciardo's Red Bull in third is 1.641s. 08:47 Raikkonen moves up to fourth for Ferrari, a tenth behind Ricciardo in the 'best of the rest' zone. 08:48 Alonso now takes third for Ferrari, 1.458s away from Hamilton. 08:49 EDD STRAW: Alonso is mightily committed through the Swimming Pool and carrying good speed. Both Lotuses look strong through here as well. 08:50 A promising lap from a Monaco (F1) rookie as Magnussen goes fourth for McLaren, just 0.06s off Alonso. 08:50 EDD STRAW: Really impressed with Vergne. He's very fast on entry down here at the Swimming Pool. 08:50 Alonso sets the best first sector of anyone so far, but the middle of his lap is less strong. 08:50 Vettel has finally left the bottom part of the timesheet, but he's still far from the top in eighth. 08:51 After that spell when the Mercedes had the track to themselves, now they're in the pits and every single other car is on the circuit. 08:52 EDD STRAW: Raikkonen is looking super-smooth and quick. There's a contract in style to Alonso, but it looks effective. 08:54 The pack is getting a little closer to Mercedes, improvements from Ricciardo and Alonso are now (a little) less than a second off the Mercedes. 08:55 Vettel improves to fifth now, 1.503s off the pace. 08:55 Magnussen complaining about blistering and told to pit if the situation is too bad. 08:55 EDD STRAW: It's hard to look beyond the Mercedes based on what I've seen so far, although the Red Bulls and Ferraris do look decent. I'm also impressed with Maldonado - although that isn't unusual here. 08:56 EDD STRAW: Williams also looks good from trackside as usual. It's very nimble and the rear is easily collected. 08:56 Living up to STRAW's billing, Williams goes up to fifth with Bottas. 08:57 Hulkenberg reports he is struggling with the brake balance of his Force India. 09:00 Ricciardo now moves right onto the Mercedes' tail with a 1m18.506s, 0.235s off Hamilton and within 0.029s of Rosberg. 09:00 EDD STRAW: I never cease to be impressed by F1 drivers around this circuit. Shows how good they really are, even the so-called 'bad' ones. 09:01 Perez moves up to seventh place. Force India has been solidly in top 10 contention so far today. Hulkenberg is ninth. 09:02 Thirty minutes to go, and all drivers except Chilton, who stopped earlier, have gone quicker than the fastest Formula Renault 3.5 car during practice earlier this morning. 09:03 EDD STRAW: Red Bull looks great in the Swimming Pool section. It can ride the kerbs and bumps beautifully, very driver friendly. "Energy recovery is easy here: the corners are all taken at an ave of >100kph and the MGU-K will have enough chance to recharge." 09:05 New fastest first sector from Rosberg as he responds to Hamilton. 09:05 EDD STRAW: The Lotus looks stronger in the fast corners than it does in the slow stuff. 09:05 Force India asking Perez about the chance of doing a high-fuel run now because the chance of rain has increased to 50 per cent for the afternoon session. 09:06 Rosberg drops time further around the lap and it ends up being a tenth shy of his previous best. 09:07 Next time round Rosberg does improve, closing the gap to Hamilton to 0.032s. 09:12 Another lock-up for Hamilton, who has had a few already in the session. 09:13 The Mercedes are continuing on longer runs now, both drivers notching up their 27th laps of the session. 09:15 Hamilton told to brake two metres later for Sainte Devote in order to avoid the bump there. 09:17 Sutil has crashed his Sauber at Mirabeau. 09:18 With the yellows clear, Raikkonen is on a better lap. He's currently 10th, five places behind Alonso. 09:18 Sutil has lost the rear end under braking. "The rear just snapped," he says. The damaged car is being recovered already. 09:19 Raikkonen's lap tails off and he stays 10th. 09:19 The track has been cleared after Sutil's crash and the green flag is back out. 09:20 At the back, Marussia's Bianchi has a clear edge in the tail-end fight. He was as high as 12th earlier, but though he's slipped back to 19th, he's half a second clear of Ericsson. 09:21 Quite a few drivers are finding more time in sector one, then not improving beyond that. Raikkonen, Vergne and Gutierrez latest to do so. 09:21 Hulkenberg complaining about bottoming to his race engineer. 09:23 EDD STRAW: The Mercedes takes the kerb at the Swimming Pool beautifully. Others hit it, the W05 glides over it. 09:24 Ricciardo is having one last shot at getting among the Mercedes as he improves in sector one. 09:25 Magnussen nearly made contact with a slow Force India as he was about to complete a flying lap. He had to lift a lot to avoid it. 09:26 With just under four minutes left, everyone is out except the Mercedes and the crashed cars of Sutil and Chilton. 09:27 Ricciardo again improves in the first part of the lap, but there might be too much traffic around for this run to move him up from third. 09:28 Despite dodging between three cars between the tunnel and Rascasse, Ricciardo is only a tenth shy of his best time. 09:29 The yellow flags are out again as Gutierrez overshoots Sainte Devote. 09:30 The Sauber driver had a big lock-up and had to take the escape road. His car is parked there as the session is about to reach the end. 09:30 Alonso also involved in an incident as he runs wide at Mirabeau. He didn't make contact, however, and managed to continue. 09:31 The Spaniard used reverse to return to the track. You don't see that too often in F1 these days. 09:47 The rain has started to fall in Monaco. It's very light at the moment. 09:48 Meanwhile, Adrian Newey has put an end to speculation linking him to Ferrari. 09:59 EDD STRAW: "Interesting to note where Hamilton and Rosberg found their speed in FP1. Rosberg faster in sector 1, Hamilton faster in sector 2 and similar in the final sector." "A better FP1 for us than we've had for a while and both drivers are reporting decent progress on set-ups and car balance." 10:12 As you would expect in Monaco, Flavio Briatore has just been spotted in the paddock. 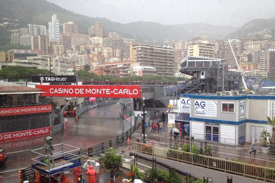 10:13 GP2: Monaco After that light rain shower it is very much dry now for GP2 free practice, which has just begun. 10:31 After Alonso stated his frustration by the lack of support from his "closest friends", Ferrari has issued a statement in which president Luca di Montezemolo labels the Spaniard "the best driver in the world." 10:35 The FIA is to continue with its efforts to change engine noise despite the 'trumpet' failure. 10:40 GP2: Monaco Felipe Nasr has just caused a red flag. He hit the wall at Portier, then outbraked himself got launched by the kerbs at New Chicane and ploughed into the tyrewall. He's wrecked his front wing and the left-front corner of his Carlin car. 10:57 GP2: Monaco Championship leader Jolyon Palmer ends 45mins of free practice with the fastest time, the DAMS driver setting a 1m20.707s on supersoft tyres, ahead of Johnny Cecotto Jr and Stephane Richelmi. Stefano Coletti was the fastest of those on the soft tyre in fourth, 1.1s off the pace, ahead of Mitch Evans. 10:59 Very dark skies in Monaco and light rain hitting the track once again. It could get worse at any point now. 11:21 JONATHAN NOBLE: "It has been threatening to rain all day - even though the F1 world arrived in Monaco to blue skies this morning. "The micro climate here has not disappointed either, with a major downpour - including a decent hail storm - delivering plenty of water on to the track over the past 20 minutes. "Teams now face the dilemma of deciding if the risk of crashing in FP2 is greater than the knowledge gained from proper wet weather running." 11:23 The last wet Monaco GP was in 2008 - which was one of Lewis Hamilton's particularly epic wet-weather wins, and came despite him glancing a barrier and getting a puncture early on. Other famous wet Monacos include Michael Schumacher's dominant 1997 triumph (the day the Williams of Jacques Villeneuve and polesitter Heinz-Harald Frentzen started on slicks when they really shouldn't have done) and the 1996 race in which Olivier Panis came from 14th on the grid to win his sole GP and the last for the Ligier team. 11:25 Wet races dramatically increase the amount of overtaking in Monaco too, incidentally. There were 21 on-track passes in the wet 2008 race compared to four in both 2009 and '10. DRS (and perhaps the presence of pass-able cars from the 2010 team intake) has made a difference in Monaco as well, though. We had 16 overtaking moves in both 2011 and '13. 11:28 Earlier on we were admiring Marcus Ericsson's retro Ronnie Peterson helmet. In other 'current F1 stars showing admirable respect for motorsport's heritage news', we've been hearing about Marussia racer Max Chilton's plan to contest the Goodwood Revival in a 1965 Ford Mustang. Sauber test driver Giedo van der Garde is heading to Sussex for the September event too - he'll be racing an AC Cobra. There's more news about the line-ups for both the Goodwood Revival and the Festival of Speed in this week's AUTOSPORT magazine. 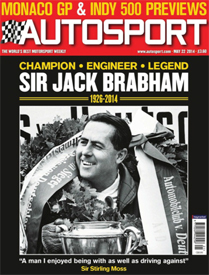 11:39 The main theme of AUTOSPORT's print edition this week is paying tribute to three-time F1 champion Sir Jack Brabham, who died on Monday. Monaco was the scene of some pivotal moments in Brabham's career. He took his first F1 front row here in 1958, and first win here in 1959 (and maiden podium and fastest lap in the process too). That would be his only Monte Carlo victory - 1970 was famously 'the one that got away', when he made a mistake at the very last corner and let Jochen Rindt through, but he did take pole in 1967, the 10th qualifying top spot of his career. 11:51 GP2 squeezed its session in before the rain came down. Jolyon Palmer was quickest and among the F1 proteges it was a case of Williams (Felipe Nasr) ahead of Caterham (Alexander Rossi), Force India (top Hilmer man Daniel Abt) McLaren (Stoffel Vandoorne) and Ferrari (Raffaele Marciello) in eighth, 10th, 12th, 14th and 15th places. 11:53 BEN ANDERSON: "About to head trackside for this session. A bit of wet running should make for some lively viewing around this track!" 11:58 Several drivers still walking around, suggesting the start of the session may be slow due to the tricky track conditions. 11:59 Forecasts are suggesting a reasonably high chance of further rainfall to come in the next 90 minutes as well. 12:00 The green lights are on, and the session is underway. But no sign of any cars leaving the pits yet. 12:02 No one willing to dry up the track for their rivals, clearly. 12:02 EDD STRAW: "No great surprise to see nobody rushing to go out onto the wet track in the first few minutes. Definitely worth the less experienced Monaco drivers having a look at the track in these conditions. Daniil Kvyat is the only Monaco rookie here though." 12:03 Fernando Alonso - F1's 200 per cent race monster best driver (if we combine the avalanche of praise he's received from other people's bosses and his own of late) - is still wearing an anorak, while in the Lotus pit there's no urgency to get any tyres on the cars, and this time that's not because they're broken. 12:05 Valtteri Bottas is the first man to leave the pitlane in the Williams. His car sporting intermediates. 12:05 EDD STRAW: "Good to see Bottas heading out. He's a fantastic wet-weather driver. He's out on the intermediate Pirellis." 12:07 And that's the end of the on-track action for now, as Bottas is back in the pitlane. 12:07 BEN ANDERSON: Wheelspin all the way for Bottas on his first run through the Swimming Pool section. The gears can't come quickly enough! 12:09 A TV camera tour of what drivers are up to reveals Vettel chatting to Helmut Marko, Perez hanging out on a pit building balcony, and Ericsson seemingly texting the engineer stood next to him. 12:09 No rush from anyone else to jump onto the track. No engine sounds to be heard at the moment and most drivers are out of their cars. 12:10 "Looks very slippery out there Valtteri, any comments?" asks Williams. "Yes, it was very slippery," Bottas replies. Possibly with a touch of irony. 12:14 Lotus has fired up Grosjean's car, but the Frenchman is just watching from the garage. 12:16 The noise of the 2014 F1 cars is at its most distinctive in Monaco where it can rattle off the surrounding walls and buildings. The fact that Grosjean has his fingers in his ears while Lotus revs the car proves that they do make some noise. Earlier today JONATHAN NOBLE revealed that the FIA hasn't given up on efforts to try to change the noise despite the general consensus that last week's 'trumpet' test was a bit underwhelming - but in his column this week he argues that's time to accept the sound and move on rather than chasing a 'Wacky Races' fix. 12:17 Raikkonen is in his car and looking like the driver closest to having a go at running. But no sign of that yet. 12:18 BEN ANDERSON: The sun is desperately trying to break through down at the harbour. Hopefully he can coax the drivers out of their current hibernation. 12:20 Ferrari boss Marco Mattiacci chatting in front of the team's garage. He will be making his debut in the FIA press conference this afternoon. 12:21 JONATHAN NOBLE: "If you are wondering why drivers are not going out, it is because they already know how difficult things are with this current generation of cars on a wet track like Monaco. "The risks are too great - especially if the forecast is for better weather over the remainder of the weekend. "Speaking to Jenson Button on Wednesday, he said: 'If it is wet it is going to be very tricky. There is no high speed so you cannot get heat in to the tyres, and with the tyres we have got it will be very, very tough.'" 12:21 An engine is fired up! But let's not get carried away just yet. 12:26 There was no luck. Nearly half an hour gone and still no sign of any action. 12:27 BEN ANDERSON: The Swimming Pool crowd is starting to whistle and boo at the lack of action. Can't say I blame them. Come on guys! 12:28 Fans are getting impatient and demanding some sort of action from the grandstands. 12:29 EDD STRAW: "Have been analysing the laptimes from this session. Bottas did a 48.8 in the middle sector. Did a 36.7 this morning in dry conditions. End of analysis." 12:30 One hour to go. One lap completed so far. 12:31 EDD STRAW: "If this was 1998, Minardis would be circulating and keeping people amused. Send for Shinji Nakano and Esteban Tuero!" 12:31 The action in the grandstands is rather frantic, however, as fans deploy a huge Ferrari banner. 12:36 EDD STRAW: "While watching trackside earlier, one driver that it was a shame not to see in action was Mark Webber. He was a real master of Monaco. At his best around here." 12:37 Sutil is getting belted into his Sauber, and the team has tweet-promised its fans that it will be out when it's dry enough. 12:38 EDD STRAW: "So, nobody really wants to go out on track to dry the track until other cars have been out to dry the track. Getting to the point where some will actually have to head out anyway though." 12:39 BEN ANDERSON: Applause now in the grandstand as the Sauber comes out! 12:39 You better sit down to hear the news: a car is leaving the pits. It's Sutil, with intermediates. 12:40 EDD STRAW: "Sutil is out on the intermediates. He's a great driver to watch in damp/intermediate conditions. Has a good feel for the available grip. His best conditions are probably a little less wet than this though." 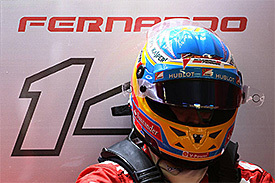 12:40 Alonso is also getting ready inside of his Ferrari. Hopefully the action will intensify soon. 12:40 Kvyat heads out, also on intermediates. 12:41 Vergne also leaves the pits in the Toro Rosso. 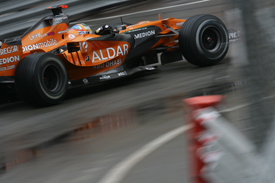 12:41 A damp Monaco has been a happy hunting ground for Sutil in F1 - topping Saturday morning practice in the wet for Spyker in 2007 and running fourth for Force India (as it then became) a year later before being rammed by Raikkonen were pivotal moments in his early grand prix career. 12:42 Sutil is back in the pits after an installation lap. 12:42 BEN ANDERSON: Dry patches are appearing on the track at the Swimming Pool complex entry. The circuit should improve rapidly during this final part of the session. 12:42 The sun is now shining (sort of). 12:43 Kvyat stays on track and looks set to be the first man to complete a timed lap. 12:44 Raikkonen has joined the action too, and so has Alonso. 12:44 Kvyat sets the first time of the session: a 1m44.982s. 12:45 He is outpaced by Vergne right away, the Frenchman over two seconds faster with a lap of 1m42.484s. 12:46 BEN ANDERSON at the trackside: Vergne showed way more confidence over the kerbs than Kvyat, but the Russian is flirting with them now. 12:46 Improvements from both Toro Rosso drivers, with Vergne still ahead with a 1m38.933s. 12:48 The track conditions seem to be improving quickly, and that's reflecting in the lap times. Kvyat in the 1m37s now. 12:48 BEN ANDERSON: The Ferraris are both taking big lumps on the right apex kerb, but have to lift of as they do so. The Toro Rossos are hard on the throttle all the way. 12:48 Raikkonen appears to be slowing on the pits straight. 12:49 Replays show Kvyat losing it under braking for Sainte Devote, he gets very sideways and ends up in the escape road but misses the wall and rejoins. 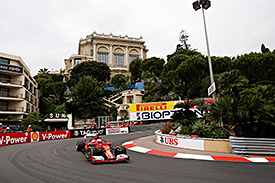 12:49 Raikkonen's Ferrari is stuttering its way up the Beau Rivage at a very reduced pace. 12:50 Noise news from BEN ANDERSON: "The Red Bull-Renault emits an aggressive gargle off-throttle. Ferrari turbo gives a high-pitched 'pow' sound". 12:50 Raikkonen is completing a very slow lap to return to the pits. He has a problem of some sort. 12:51 Meanwhile, Magnussen jumps to the top with a 1m35.805s. 12:51 EDD STRAW: "All those on track are using intermediates at the moment." 12:52 Raikkonen has made it back to the garage as Ferrari starts to investigate the problem. 12:52 Now it's Vettel who goes quickest. A 1m33.780s for the Red Bull driver. 12:54 As the track continues to dry up, the times continues to tumble. A 1m32.588s for Vettel, now followed by Alonso and Magnussen. 12:55 Slight incident in the Red Bull garage as one of the crew pushing Ricciardo's car back in gets clipped by the left front wheel and falls. He gets up unhurt and resumes work. 12:55 Only nine drivers have set a time, all of them using the intermediate tyres. 12:56 Button sets a new benchmark in the McLaren: 1m32.423s. 12:59 We enter the final half hour of the session, and still no sign of the Mercedes drivers. 13:01 Jules Bianchi reckons it's too wet for slicks still: "In the middle, it's still too wet for dries. It's not good for these tyres, but it's still too much." 13:02 Ferrari has confirmed that whatever Raikkonen's problem is will keep him in the pits for the rest of the session, so his Thursday is over. 13:02 The action has now slowed down once more: no cars on track. 13:04 Button leaves the pits, but still using intermediate tyres. 13:07 Three purple sectors for Button, who improves to a 1m31.594s. 13:08 No sign of slick tyres yet with some 21 minutes to go. 13:09 BEN ANDERSON: "Woah! I've never stood so close to F1 cars in motion. Could feel the vibration as Vettel aimed the Red Bull right at me and booted the throttle through Tabac." 13:10 Button completes his run and returns to the pits. Bottas, Magnussen and Sutil out on track now. 13:11 Magnussen gets it slightly wrong in the Swimming Pool complex and bumps over the run-off. 13:12 The Dane has jumped to second behind his McLaren team-mate. Hamilton is about to leave the pits, according to the radio messages from his engineer. 13:12 Mercedes tells Hamilton the plan is a quick outing on the intermediates, into the pits for a practice stop during which the option tyre will go on, a few laps on that, then primes. 13:13 And indeed, Hamilton is out on track. 13:15 Rosberg has also left his garage, as Hamilton completes his lap and returns to the pits. 13:15 The Mercedes practice pitstop didn't follow the plan, with no change to slicks after all. Presumably Hamilton felt it was still too damp. 13:16 Meanwhile Ferrari says that Alonso "could try slicks before the end of the session". 13:16 Mercedes asks Hamilton to check for wet patches and give a hint of how long it will be before slick time. 13:19 No lap times for the Mercedes duo yet. Or for the other 11 drivers who have not completed a timed lap yet. 13:19 Mercedes gives Rosberg a reminder to put more heat into his front brakes. 13:20 We enter the final 10 minutes of the session. Will anyone go out on slicks? 13:20 EDD STRAW: "Vergne has apparently gone out on softs, with Hulkenberg taking the super-softs. Interesting to see what times can be done on slicks." 13:20 The answer is yes: the Toro Rossos are out on dry tyres. 13:21 Purple S1 and S2 for Vergne. Expect an avalanche of cars leaving the pits soon. 13:21 Indications are that it was a gearbox problem that has sidelined Raikkonen at the end of this session. He managed four laps before that struck and is last among the nine drivers that have set a time. 13:21 Mercedes is poised to take slicks too. 13:22 Vergne goes quickest with a 1m26.002s. Clearly it's time for slicks. 13:23 Hulkenberg jumps up to second with the super-softs, some three tenths of a second off Vergne's best. 13:24 Chilton is reporting some difficulties with the Marussia's clutch. 13:24 Now Hulkenberg takes P1 with a 1m22.699s. 13:24 Perez has a noisy, squeaky lock-up into Sainte Devote but keeps the Force India clear of the wall. 13:25 A further improvement for Hulkenberg despite a scare at Sainte Devote. The Force India driver's new benchmark is 1m22.047s. 13:26 Vergne is told some more front tyre temperature would be handy. Gutierrez's instructions seem to be Jose Mourinho related as he's told: "before the start of the lap, special one off". 13:27 Alonso puts Ferrari on top with a 1m19.498s, miles ahead of everybody else. 13:27 Massa has a huge lock-up into the second part of the Swimming Pool then comes up abruptly behind the slower Mercedes of Rosberg, who he dodges. 13:28 Hamilton has reduced the gap to Alonso to around half a second and is on another flyer. Purple S1 so far. 13:28 "Yeah... traffic. Big traffic," is Massa's summary to Williams. 13:29 Vettel has improved and moves to second. Hamilton did not improve, but he is still on track. 13:29 Ericsson has gone nose-first into the barrier on the exit of Portier. 13:29 Ericsson's crash looks a fairly light one and he's trying to reverse the Caterham and continue. 13:29 Red Bull suggests Ricciardo backs off in the final corners to create some space as there are "no good gaps" for him. 13:30 The time has run out, but Alonso has just set the fastest S1. 13:31 Grosjean is reporting some strange noises from his Lotus. 13:31 A 1m18.482s for Alonso, by far the quickest time so far. 13:31 Hamilton has joined the Spaniard in the 1m18s, but over four tenths behind. 13:32 Alonso stays on top as the session ends. Hamilton second and Vettel is third. 13:34 Problem for Massa at the end as he's urged to "abort the start and cool the car" pretty firmly by the team. 13:35 Button confesses to McLaren but he bashed the front right wheel on the chicane wall on a late lap so it's worth a check. 13:36 That probably wasn't the most enlightening practice session for your Castrol EDGE GP Predictor choices... You've got until five minutes before qualifying to make your picks, and this week's prize is a Sony PS4 console. 13:37 Bottas is giving Williams some feedback on tyres, suggesting warm-up was slow at first and there was drop-off on the last lap, but he admits that it could all have been down to the conditions. 13:39 Monaco isn't the only major motorsport event this weekend - there's also the Indianapolis 500 to look forward to on Sunday. 13:50 BEN ANDERSON just overheard this "ironic megaphone cry" from the grandstand by the pits: "if we'd waited for it to stop raining in Malaysia, we'd have been here all week". Our reporters are now in the paddock getting reaction from drivers and teams. 13:58 JONATHAN NOBLE has returned from Red Bull, where Daniel Ricciardo in particular is very bullish about the car's pace here. Full story soon. 14:19 Caterham is another team pleased with its day's work. Both Marcus Ericsson and Kamui Kobayashi reported that initial handling problems improved with some mid-session set-up changes in the morning, and they got through the day without any technical dramas. Kobayashi gave Caterham 'backmarker class honours' at the end of the day as well, beating Marussia man Bianchi by 0.013s in practice two. 14:28 There was a flurry of early excitement this morning at the prospect of Lewis Hamilton missing the start of opening practice. Television crews picked up a Mercedes man in a boat fetching Hamilton as the green light was about to come on to begin practice one, and then the unusual sight of the championship leader sprinting through the paddock on foot and in his civvies. That was naturally a hot topic when BEN ANDERSON joined the press scrum around Hamilton post-practice. The answer was a pretty simple one: "I overslept". 14:32 Hamilton's alarm clock related misdemeanour provided almost as much domestic insight excitement as Nico Rosberg's answer to the question "what will you do on the day off tomorrow?" Reply: "I've got lots of friends and family here. I'll play some backgammon. Work on the car." 14:33 GP2 - Monaco: Jolyon Palmer makes his bid for feature race pole position, topping his qualifying group by almost half a second in his DAMS entry. Mitch Evans was second in Group A after a last-ditch flyer, ahead of Johnny Cecotto Jr and Daniel Abt. Group B, for even-numbered cars, will now get their chance. The fastest session will set the odd-numbered side of the grid, with the quickest man starting from pole. 14:35 GP2 - Monaco: Palmer set two laps good enough for the fastest time in that session. Cecotto blamed Abt for holding him up at the Nouvelle Chicane, but Abt was having his own issues with another tardy driver in front. Series frontrunner Felipe Nasr, who shunted in practice, was only eighth in that session, so he'll be starting from row eight. 14:38 In more informative moments from the Mercedes gathering, Hamilton said the morning was good enough that the loss of so much afternoon track time hadn't been a problem. "If we'd missed out both sessions then maybe [it would've hurt], but to get one session in the beginning was a huge plus because I got a lot of running," he said. "I feel pretty set for Saturday." 14:41 JONATHAN NOBLE is now at Lotus, where the drivers say the team's main problem today was that temperatures were too low to get the tyres working properly on their car. 14:57 GP2 - Monaco: Rio Haryanto tops Group B qualifying, but he is almost a second away from Palmer's Group A time, so Palmer will start Friday's feature race from pole position. 14:59 GP2 - Monaco: Caterham's Haryanto just shaded Stephane Richelmi in Group B to take the even-side of the Monaco starting grid. Stoffel Vandoorne was third fastest (so will start sixth), ahead of Stefano Coletti and Julian Leal. 15:23 We didn't have many shunts in practice today, but Adrian Sutil provided one in the morning. He's held his hands up over it. "I had a snap oversteer in Turn 5 [Mirabeau], so I touched the barrier. "The tyres were not up to temperature and it was difficult to keep the car under control. 15:26 Jean-Eric Vergne popped up in fourth place in second practice amid the sprint for times on the drying track. He's not expected row two on Saturday, but he's still pretty perky. "I like this track and even if I don't think I'll be P4 in qualifying, I'm still happy with what we achieved today. This has been a proper way to build up confidence and it gives us an additional boost to fight for Q3 and points." His Toro Rosso team-mate Daniil Kvyat was in learning mode today, as the only one of the 2014 rookies who hadn't raced here at all in his junior career. 15:31 BEN ANDERSON has been getting drivers' thoughts on the lack of track action during the wet part of practice two, and hearing of their sympathy for the fans. Story to come shortly. 15:32 Jenson Button admits it is impossible to know where McLaren stands after today. He finished eighth in second practice. "The feeling in the car is quite nice but it's impossible to say how quick we are, I really don't know. "There's still more progress to be made with the car and I know the guys are all working flat out back at the MTC and it [would] be nice to give them a reasonable result some we can progress from here and keep developing." Team-mate Kevin Magnussen, 10th fastest in the afternoon, had similar thoughts. "We haven't done anything yet, it's only practice. 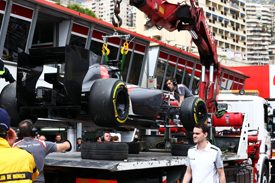 We just had a look at the track, the set-up and the balance of the car, so we'll have to wait and see." 15:37 Remember you can check the best photos from the Monaco GP weekend in our gallery here. 15:38 Mercedes' Paddy Lowe admits there is still work to be done due to the time lost as a result of the poor conditions in second practice today. "We weren't able to do all our homework on tyre wear and long-run performance but we were at least able to do a run on the option tyre, to give the drivers a feel for the car in what will be the tyre of choice in qualifying." Can Ricciardo beat the Mercedes to pole? We'll be back for full Live coverage of final practice and qualifying from 9.30am UK time on Saturday.